For full product description go to Comments tab. message logging to custom external file that can be archived, sent by email, read by some scripts etc. Download and install Log4mql from the Market. Logger will log all messages with level equal or lower to logger level. When you set logger level to WARN only WARN and ERROR messages will be logged. If you set logger level to INFO only INFO, WARN and ERROR messages will be logged. etc. All output files will be stored in FILES folder under MetaTrader installation folder for example "[MetaTrader home]\MQL4\Files\"
Log files can be monitored online using some log parsers. 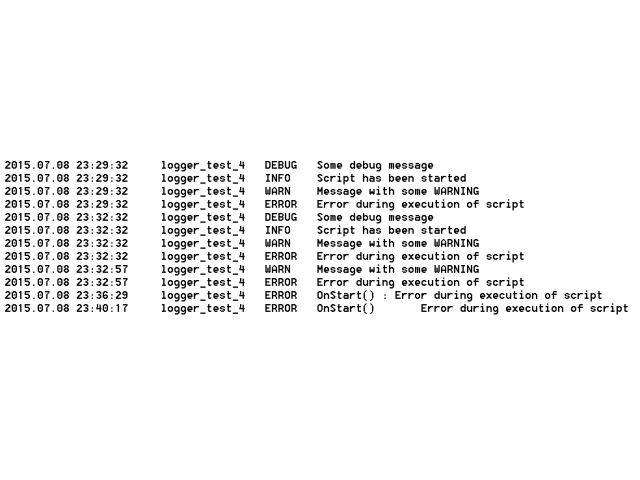 This tools can highlight different levels of log messages, can execute external scripts (for example send email when ERROR log message is logged).